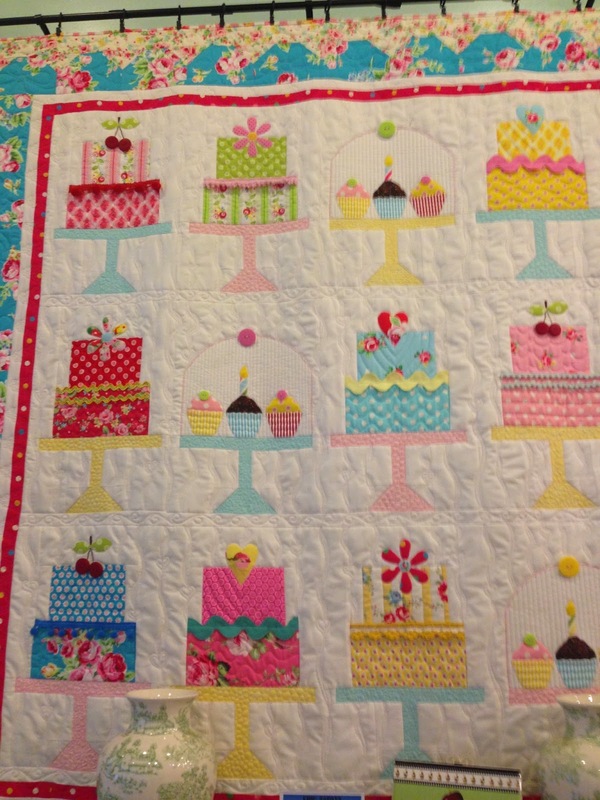 Sewn With Grace: Quilty Fun Turns One! Yesterday when I went to one of my favorite blogs, I saw that there was a birthday celebration going on. Lori Holt of Bee In My Bonnet was celebrating the one year birthday of her fabulous book, "Quilty Fun". To celebrate Lori designed the cake block, in the first photo, and has offered it free to her readers on her blog. I could not go to sleep last night until I tried making it. Without a doubt, Lori is one of my favorite designers. Her patterns are fun, easy to understand and easy to make. I have been sewing up her patterns for a long time. I made the cake quilt for my friend Nancy who opened a restaurant/bakery a couple of years ago. The quilt hangs in the restaurant and I'm always trying to figure out a way to sneak it out the door. I made Lori's cover quilt as part of a quilt along before her book was released. It hangs in my kitchen eating area and people often comment on it and go up to touch and study it when they are here. 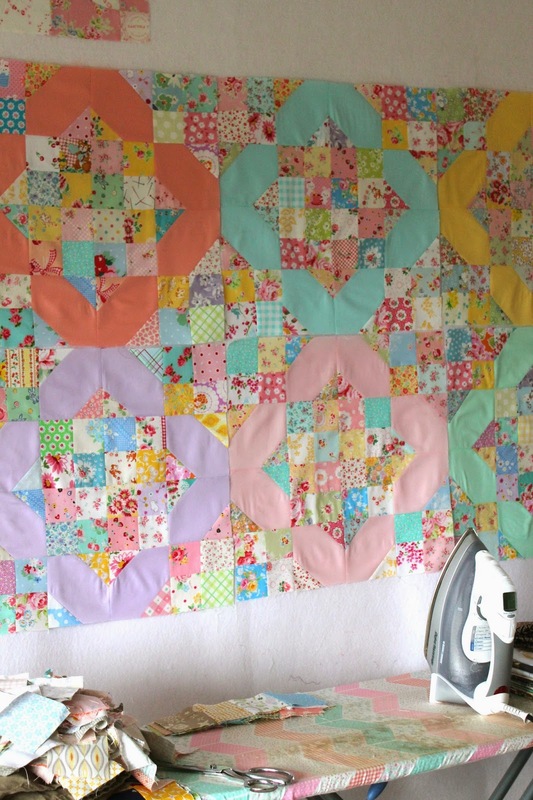 Lori's scrappy crossroad blocks are currently on my design wall. I am making a king size quilt for my bed. I am in love with the colors and pattern and I'm taking my time to carefully put this together for I know it's going to be a treasured heirloom. The last photo is a fun quilt from another quilt along of Lori's. Not only is it a yarn basket but also will pass as an Easter basket quilt. I had so much fun making this and it's currently on it's way to the long-arm quilter. There are many more patterns by Lori that are waiting to be made. I encourage you to visit her etsy shop (click on "Quilty Fun" above) and check out all the fun patterns. Don't be intimidated. What looks complicated is really not complicated at all. Lori has a very clear way of presenting a pattern and breaking it down to very manageable and understandable parts. You will have so much fun sewing these patterns! As the pattern comes together I often think, how did Lori do this? It was so easy! Lori has produced the most gorgeous fabric lines for Riley Blake so head over to the Fat Quarter Shop site to check them out. 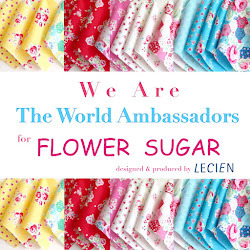 My current crush is Flower Patch. Thank you, Lori, for sharing your talents and creativity with us. You have inspired me and made me a better quilter. I cannot wait to make more of your quilts! 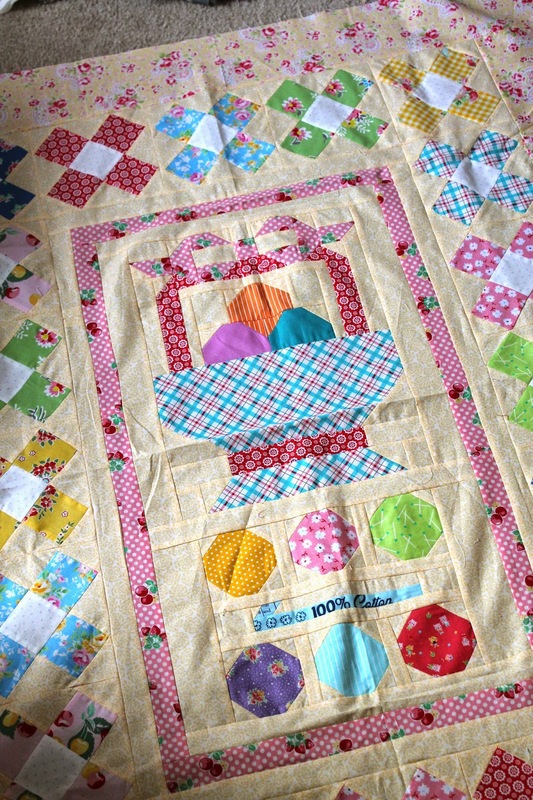 A very happy first birthday to "Quilty Fun"!! The block is amazing and a very impressive set of quilts. What a beautiful cake block!!! It's perfectly delicious :) I can see that you are a huge Lori fan just like me, but I already knew that! Your quilts are gorgeous, and the cake one is out of this world!!! I really wanted to make that one but I only have so much wall space. I may change my mind. The appleicious one is cut out . Thanks for making my day with all of your pretty quilts and lovely colors and prints. 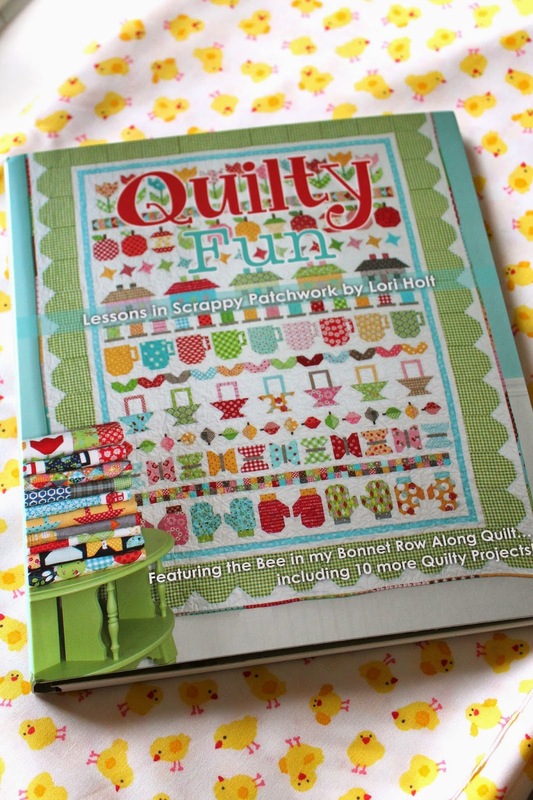 My husband bought me the Quilty fun book last year for Christmas! 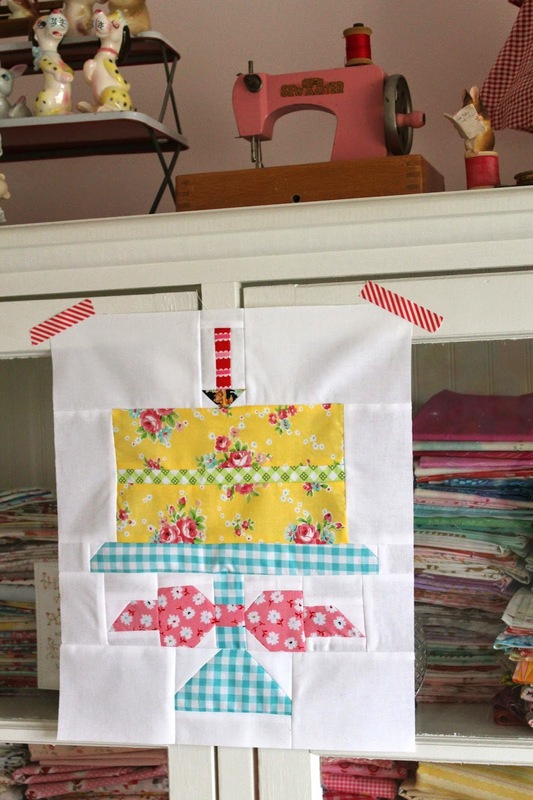 Love your cake quilt! Do you know what the fabric is under the Quilty Fun boo? Those little chicks are so cute! I love all your quilts, Renee! I completely agree with you - Lori's patterns are always a treat to sew, and I get that "wow" feeling every time I make something. 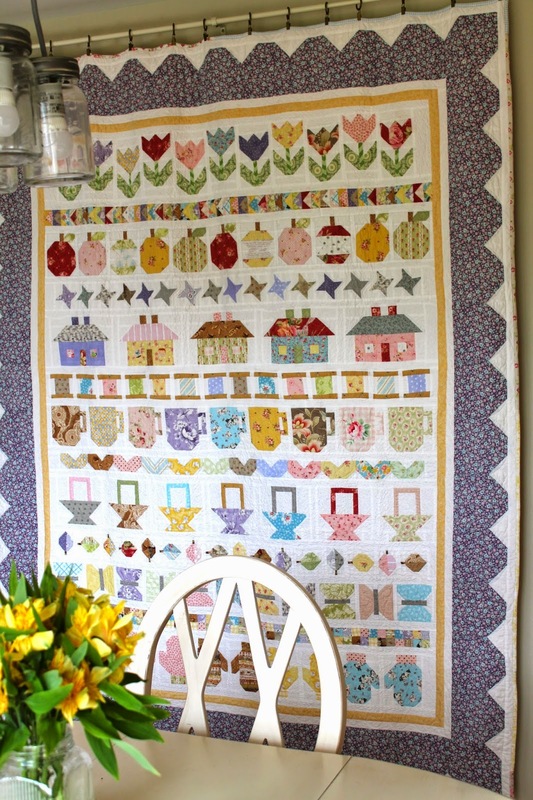 Your scrappy crossroads blocks will be beautiful in a king-sized quilt!